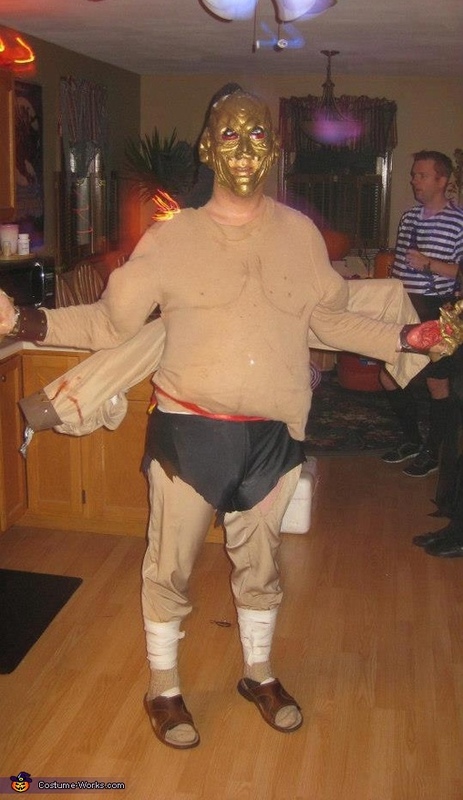 For Halloween this year, I decided to be Goro the four-armed original Mortal Kombat grand champion. Since it was not commonly done, I wanted to start with the arms. By duct-taping two water noodles together covered in a beige sheet I was able to slide the item through the back of my shirt. For attempted added effect, I used a black makeup stick to draw muscles. At the end of each of the arms I fastened two pieces of AC Moore brown sheets of foam to resemble Roman gauntlets since the regular mock gauntlets were just right for my real arms. I used gold metallic paint to a vampire mask and pair of monster hands repectively, in order to make them standout. A pair of small red vampire shades were worn under the mask to replicate the creature's reddish pupils. Winter socks were worn for the feet, with my calves wrapped with tape normally for the top and bottoms of hockey sticks. A whole was cut in the top of the mask to fit a black strand of netting to emulate Goro's signature Emperor's hairstyle. I cut a pair of my blue athletic shorts and worn them over a pair of beige yoga-styled pants.